Range: Northern California through British Columbia. Both sides of the Cascades to northern Idaho and Nevada. Climate, elevation: Prairies, thickets and coniferous forests up to about 1900 m in elevation. Associated species: Festuca idahoensis, Achillea millefolium. Hitchcock and Cronquist caution against the transplantation of native stock as the species does not survive the disturbance satisfactorily, a tendency noted by other gardeners (e.g. the Royal British Columbia Museum). Growing this lily from seed requires patience – from seed to flower will take 3-5 years. The plant flowers from July to August, with the seeds ripe from August to September. Collect seed pods as they begin to dry out. Sow dry seeds in well drained, humus rich soil in late fall or early winter (cold stratification required). Sowing seeds in flats following collection is probably the easiest method of stratification. Otherwise, stratify for about two months. Seeds germinate in spring. Keep seedlings moist. Transplant young bulbs (1-2 years old) to their final location. Avoid transplanting mature bulbs. Mature bulbs do have bulblets that can be split off and planted, however. Plants require moist soil and can tolerate some shade. While growing plants to flowering size, keep soil moist. Plants can withstand dry conditions, especially when mature, but will stop growing for the season when conditions become dry. For production of large flowers, continue to water during the summer months. 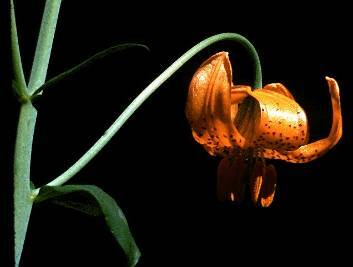 Hebda, R. Natural History: Tiger Lily (Lilium columbianum). Royal BC Museum.